When the Digital eXperience Guardian is physically ready, then is the time for the software installation. The DXG software installs like any other Windows software on a variety of Windows operating systems, from XP to 8.1. 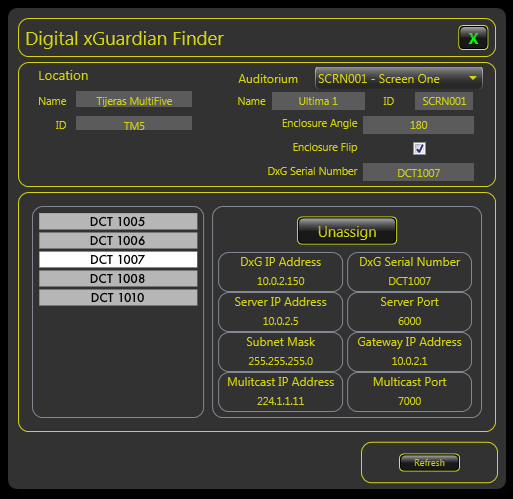 There are two pieces, the DXG GUI which runs the sequence files and the DXG Finder, which locates the DXG units on the networks and assists in configuring them. Let's not go through the steps of installing a Windows program. If you are not up to that task, please ask for assistance. Once both programs are installed, double-click on the DXG Finder. The DXG Finder will run but will not communicate much until a Digital eXperience Guardian is plugged into a network that is also attached to the computer that the program is running on. Therefore, lets go through the steps required to talk to the DXG – which are copied from the Ceiling Installation page. The DXG is powered by a technology called Power over Ethernet (also known as PoE, with the small 'o'.) Briefly, this internationally standardized technology allows power and Ethernet signals to co-exist on a CAT-5 or CAT-6 cable, then into the RJ-45 connector of the equipment. The power is then separated and used as if they had come over separate cables. The mixing of data and power is done at one of two places. Either there is a separate PoE Insertion device, or there is an Ethernet Switch that is PoE capable. Often these switches will only power 4 of the available ports – watch out for that. Either technique works, either technique adds yet another potential point of failure to your system, but the Ethernet Switch is the better long term solution. In either case, there is a restriction of 100 meter cable length. NB: When purchasing a cable with DB-9 connectors at each end (one male, one female – often called an RS-422 cable), make certain that all 9 pins are carried through with cable between them. There are some uses of this style of cable that allow manufacturers to only implement 4 or 5 connectors. These will not work. Depending on your particular setup, a message will appear that suggests that you use the Finder, and the Finder program will be automatically opened for you. In some circumstances you will need to find and open the Finder yourself. If the Finder sees that there is more than one network to connect to, it will ask you to choose. The DXG Finder program will show a list of available DXG units on the left side. Select one by clicking on it once. Numbers will appear in their appropriate spots, informing you of particular network information. This is where you change the IP addresses of the DXG units. See Assigning the IP Address of the DXG below. Unless your IP network addresses are being changed from the first installation – for example, if the server or gateway computer addresses change – it is probably unnecessary to change any of the other numbers. In the heading portion there are spaces to fill in during the first installation. Put appropriate information in them. For example, in the space marked "Name" under the word "Location", type the name of the Cinema and in the space marked "Name" (under the word "Auditorium") type the name of the auditorium. In other words, if the name of the auditorium for the serial number that matches the DXG in that room is "1", then put a "1" into that spot. If the name of the cinema is "Energia", type "Energia" into the spot. Likewise, if the corporate room ID for the Cinema is AAA111, type that into the Location ID spot, and if the corporate ID of the particular auditorium is GreatSpace, type GreatSpace into the ID space. It is possible to change these designations later, but it will require the work of renaming folders in a directory. Not difficult, but it is easier to do it correctly the first time. If everything looks right, click the "Assign" button. Repeat for the rest of your DXG units. You can do a ping to confirm that these IP addresses are really being talked to. If there is something odd and you need to start again, try renaming the DXG.config file in C:ProgramData/DSP/DXG. This will allow you to start over again. Re-installing the GUI software will also recreate a new folder system. Therefore, this is the time to review your backup system on the local computer being used with your Digital eXperience Guardians. As always, consult the Forum for any FAQs or hints from other installers, or call, or write.